Nun beidseitig je 6 M stilllegen und über die mittleren 41 M glatt re str, dabei in der 1. R 19X2 M re zusammenstricken = 22 M. Außerdem 6x am Ende jeder Hinr die letzte M re abheben, 1 M des Seitenteils re str und die abgehobene M überziehen, wenden, die 1. M li abheben [der Faden ist vor der Arbeit] bis vor die letzte M str, dann diese M mit 1 M des Seitenteils li zusammenstricken, wenden und die 1. M li abheben [der Faden ist hinter der Arbeit]. Zugleich in jeder 4. R 4x je 2 M abnehmen; dafür die 3. M re abheben, die 4. M re str und die abgehobene M überziehen; bis 4 M vor Ende der R str, dann 2 M re zusammenstricken und die letzten 2 M str = 14 M. Nach der letzten Abnahme noch 16 R gerade hoch str. Nun weiter mit Nadel Nr. 4.5 und 1 Faden noch 20 R glatt re str, dann die M abketten. i am fluent in german and an intermediate knitter, so that's not the problem. it's just so confusingly written (what constitutes the "Seitenteil" is never defined; i am thinking it's the 6 stitches on both sides that have been laid aside in the first sentence). luckily i have a picture, though not a close-up, so i am hoping i'll be able to figure this out. the depression really shows its ugly head in this; it requires concentration to hold several things at once in my head while performing a new task, and that runs up against my limits; very frustrating. also, lucy neatby rocks, and not just because she has the best hair. one wouldn't normally expect exquisite sushi from a place called "the firehouse", but these guys outdid themselves. if you're ever in nanaimo, give them a try. very inventive. 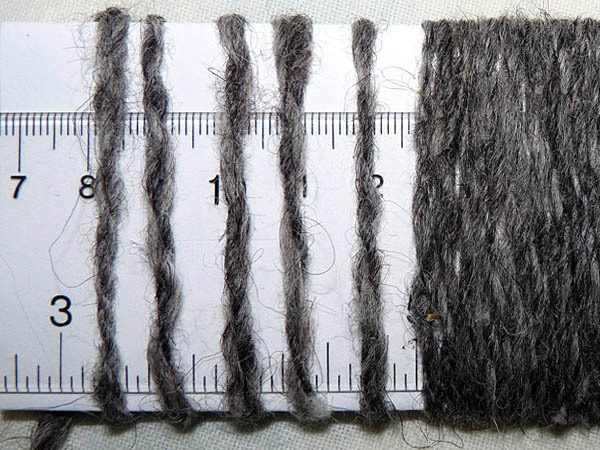 started working on a new project with this cool denim yarn i have, which is supposed to slowly wear off by washing like jeans: http://ravel.me/pi/pp. i'm trying to ease myself back into knitting by doing something a bit more demanding than stockinette, but that doesn't require careful counting like lace. oh, and sio, you wanted to see the shawl i'm working on: http://ravel.me/pi/js -- i really like this pattern. done with season 2 of leverage, will wait for season 3 to be done before i continue, i think. now watching season 2 of burn notice, which has really grown on me. my first yarn from the variegated grey shetland wool, now plied and in the process of being knit into a pocket scarf. plied it following alden amos’s advice to keep a lot of distance between the (improvised) lazy kate and myself and also between myself and the wheel, as well as tension on the plies and yarn. worked like a charm. plied one full super bobbin, and left some of the single on the storage bobbin so i can try navajo plying. washed the skein in very hot water with a little ivory soap, rinsed with fabric softener, and hung it to dry. it became quite soft and lofty! and is knitting up very nicely; true to the fleece. i was gonna make pads for the cats from this, but it’s too nice for that. it’s mostly worsted, with some thinner and thicker spots. i can see how much the quality changed between the start and the end, *heh*. the crud has mostly departed now, though a bit still lingers in my nose. the US senate advanced the healthcare bill to the floor, 60:39, dems and independents allowing it to go to debate, repubs united against it, one of them absent. mitch mcconnell: YOU LIE. i am spectacularly disorganized today. don't want to make a list because that will overhwelm me. 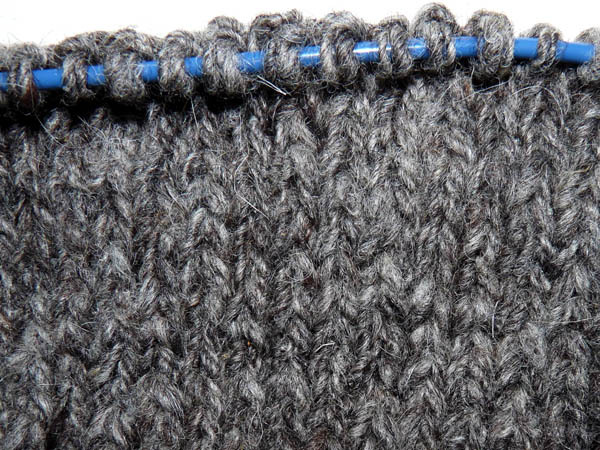 maybe i just knit -- i started knitting up my grey handspun shetland. i am inordinately proud of it; it really is a big deal for me to be knitting my very own yarn. also, it knits up better than i expected, being that it's so uneven (between DK and bulky); it looks loveably rustic, *heh*. got my ravelry  invite today. decided to go with the newer trend in handle; pleochroic. i don't really feel very piranha-like these days, and i've grown tired of the sound of "pleonastic", but i still contain multitudes. that's just what i needed, a new toy to explore. ohhh, they have a wiki! (i am still totally thrilled by wikis.) but honest, i did need to catalogue my stash, yup, yup. ravelry is for knitters, crocheters, designers, spinners, and dyers to keep track of their yarn, tools, and pattern information. and network with others similarly inclined. and drool over pretty projects. a new vegan alternative to animal-based fibres: a couple of companies, kollage yarns and south west trading company now offer yarn from corn. SWTC also has a 100% bamboo yarn. don't know how either of those measure up in green terms, though. the snake and worm are also cool -- scroll up to see them. the cast off club in the UK just held their first knitted wedding. everything was knitted, from the bride's gown and the groom's hat to the wedding cake and refreshments. fun! this looks like a nifty club. lorres_knits for http://www.thatknittingblog.blogspot.com/, which is lorre's knitting blog. lorre the sniggler, whom long-term alt.poly folks also know. who also now has an LJ as lorres, yay!